The best way to teach your kids to cook is to do it with them. But we understand: in this day and age, time is limited. Regardless, cooking is a valuable life skill and while takeout may always be an option, the kids will be thanking you once they’re out of the nest and aren’t forced to resort to instant noodles. It’s never too early to start. Enroll them in a cooking class. Go ahead, dig in, have them give some of these classes a try. You may find that their inner chef is burning to come out. HipCooks has two locations in Los Angeles and there’s an entire class called “HipKids” dedicated to teaching the little ones how to use all of their senses. It’s $35 and ideal for kids ages 8-12. Classes include kid-friendly knife skills, a chef’s hat, and a take-home recipe booklet. Private classes are also available. Cook L.A. has after-school classes designed especially for kids ages 8-15. It’s completely hands-on and menu items include caesar salad with croutons, homemade baked lasagna, shepherd’s pie, hand pies, and soft pretzels with dipping sauces. Classes typically start at 4:30 p.m. and end at 8:30 p.m. Pricing is around $50 and all skill levels are welcomed. 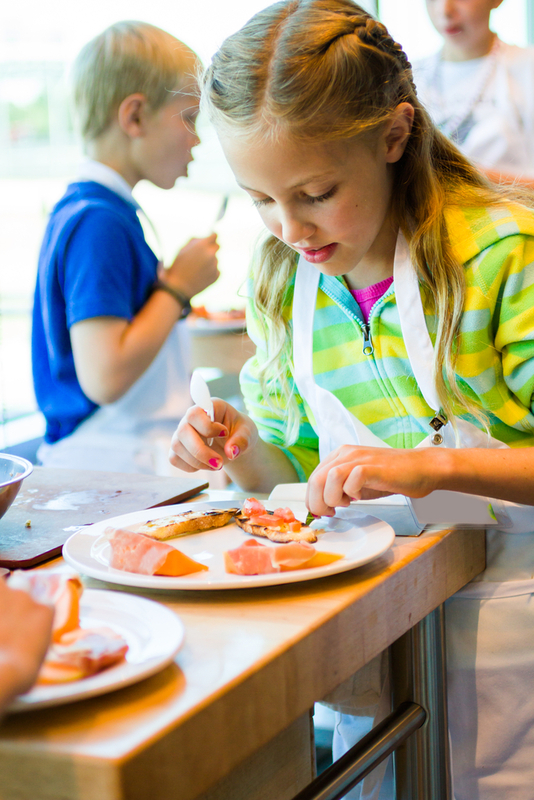 Structured for kids the ages 8-14, South Bay School of Cooking’s kids classes focuses on different themes. They have an entire summer program in July through August from 9:30 a.m. to noon. The cost is $350 and includes recipes, handouts, ingredients, lunch, and an apron to take home. A straightforward calendar is located on their site, which lists a variety of either single or packaged classes to easily sign up for. With an emphasis on well-being through the cooking of local, sustainable ingredients, Radical Cooks goes above and beyond to teach you how to make healthy creations using all kinds of meats, vegetables, and fruits. The founder, Nina Zippay, teaches many of the classes herself and welcomes cooks of all skill levels. The kids classes are aimed at the younger ones and they are limited to only six cooks in the kitchen. There are summer camps available and birthday cooking parties. You may only know Sur La Table as a kitchenware store, but they also have popular cooking classes. Many classes are for people ages 18 and older, but there are a fair amount of classes just for young ones beginning at age 7. They have a summer cooking classes with a focus on food science or baking. Classes start at around $69. Or, teach them at home! Out of the Box Collective offers Real Food Boxes, complete with simple recipes and ingredients from local farms that you can cook with your kids at home. We were curious if we could take a field trip to your facility and perhaps do a cooking demo, speak with a chef and learn about nutrition for our Friday June 17, 2016 field trip for our STAR Education Summer Camp. That Friday coincides with our Culinary camp and Sports Fitness camp and we would LOVE to expose the children to a facility where cooking as a child is a REAL and tangible thing. We would have 52 students ranging in age from 5-11 years of age and roughly 10-15 adult chaperones. We could do a 10:30-2:30pm field trip with perhaps eating something we’ve all made or just packing our lunch and bringing along. Let me know if this is at all a possibility.